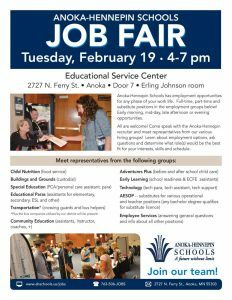 (ANOKA) – The Anoka-Hennepin School District is planning a job fair for Feb. 19. District leaders and school administrators are looking to fill a variety of openings, including full-time and part-time opportunities on various shifts. Openings include nutrition, custodial, special education, transportation, teaching assistants, community education, and more. The fair will be held on 4-7 p.m. at the Educational Service Center on Ferry Street in Anoka.